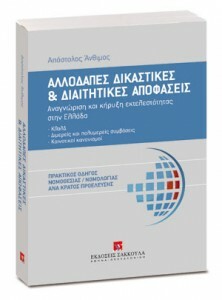 This new book by Apostolos Anthimos is a further step to record systematically the existing Greek case law in the field of International Civil Litigation. Following last year’s publication on the Service of Process Abroad the author engages in an exhaustive presentation of reported and unreported material in the field of recognition and enforcement of foreign judgments and arbitral awards published within the last 40 years in Greece. The methodology selected resembles to the one chosen in the author’s previous publication: Its central purpose is the direct access to key information on a state by state basis, i.e. the presentation of applicable laws and case law for each country separately. The analysis is based on the 4-level model, well known for EU Member States: Domestic provisions (Articles 323, 780, 903, 905, 906 Greek Code of Civil Procedure), (seventeen) bilateral & (nearly ten) multilateral agreements, and seven EC-Regulations are considered, and their repercussion in Greek court practice is thoroughly scrutinized. After introducing the reader to the existing landscape of recognition and enforcement in Greece (pp. 1-20), the main part of the book (pp. 21-274) elaborates each country of origin separately. The material varies, depending on social and commercial ties and factors. For instance, German, UK, US, Italian, and French judgments emanate both from commercial and family matters, whereas Albanian, Russian, Georgian, Armenian, and Australian judgments are almost exclusively dealing with personal status matters. By way of comparison, no judgments are reported by many African, Asian and Latin American legal orders, where no conventional link or case law could be traced. The annexes of the book (pp. 285-418) host all bilateral & multilateral conventions signed / ratified by Greece on the matter, and the respective chapters of EC-Regulations. The case law coverage is fully updated, and includes all decisionsreported until August 2014.